My husband and I picked up our adopted rescue pup on the way home from a camping/canoe trip, which helped lead to her chosen name, River. Since then, she’s accompanied us on many outdoor adventures, from spending 5 days kayaking down the Wisconsin River and sleeping in tents on sandbars for the night, to camping in almost a foot of freshly fallen snow in Michigan. Here’s a few tips we’ve learned through both research and experience. Plan a trip that’s dog-friendly. Many state and national parks have strict rules on which areas of the park will allow pets. Dogs are often not allowed in the backcountry or on some trails, especially in areas where bears, wolves, or other large predators can be present. Always be aware of leash requirements while staying in campgrounds. It may appear safe to let your dog roam free in the woods, but there could be cars, RVs, ATVs, mountain bikes, and other vehicles present on the roads or trails. Pack accordingly. 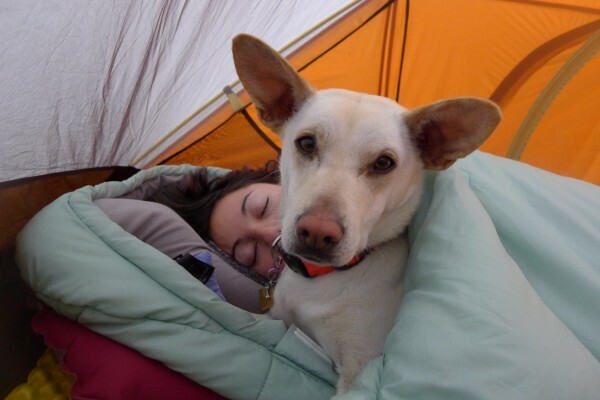 Many outdoor outfitters sell travel-friendly dog bowls and beds that can fit easily into a backpack. When we camp, we put a LED collar on our dog so she’s easy to spot after the sun goes down. On our canoe trips, River wears a doggie PFD. She’s a good swimmer, but the current can be unpredictable and injuries can possibly occur if a boat capsizes. A coat can help keep a short-haired dog warm when the temperature drops at night (or be prepared for your dog to try and get inside your sleeping bag with you!). Make sure your dog has protection from fleas and ticks by using a preventative product such as Frontline or K9 Advantix. If you are visiting an area where Lyme Disease is endemic, you may consider talking to your vet about vaccinating your dog before your trip. Be thorough in checking for ticks each time you return to base camp. Keep your pet’s limitations in mind. Planning a 15-mile long trail hike? If your dog usually spends most of the day lounging around at home, strenuous activity can come to him or her as a shock. Remember that by nature, dogs like to sprint and then sleep rather than run a marathon. Being exposed to extreme weather can also take a toll on your dog’s energy level, so be sure that they get to rest somewhere comfortably when they need to, and give them plenty of water breaks. Clean up after your dog. If you are out in the backcountry, dispose of dog waste the same way as you do your own: bury in a cathole at least 6 inches deep and 100 feet away from any water sources. Remember the most important rule of visiting the Great Outdoors: leave no trace! We’ve been on some fantastic and memorable camping trips with River, and she gets excited the second she sees the tent come out of storage. Dogs are a perfect companion for an outdoor adventure, so get out there and see the world! 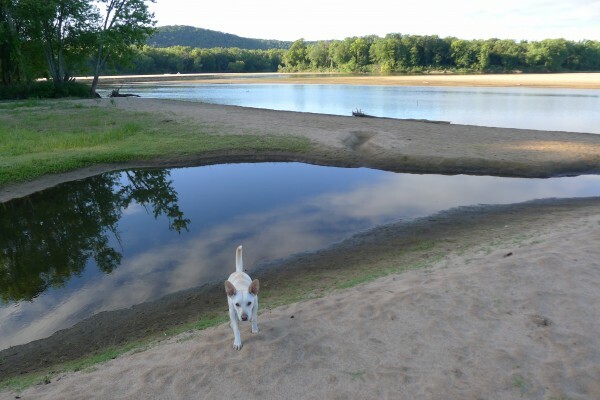 Do you take your dog to any fun outdoor destinations? Tell us about it in the comments section! Kim is Rover-Time’s executive assistant and provides support on daily office operations. She and her husband live in Portage Park with their dog, River, and two cats, Ginger Spice and Esteban. 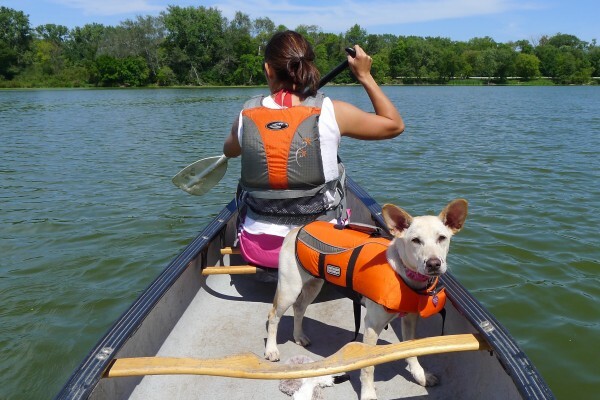 Kim loves to spend the summertime outdoors camping and kayaking on the Wisconsin River with her human and fur family (cats not included).